What a joy it is to celebrate one of my favorite people on this, the 73rd installment of Woman Crush Wednesday! 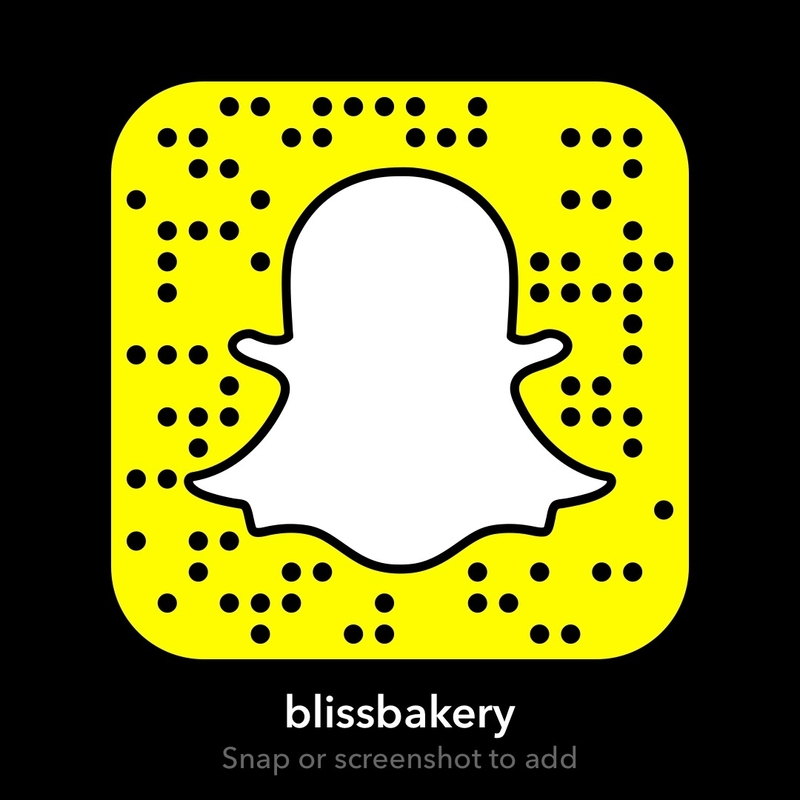 Yes it is the day I shower a female foodie with lots of love and recreate one her recipes live on Snapchat (username blissbakery). 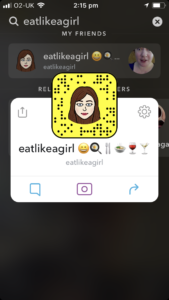 And in fact, how I met this amazing lady is through Snapchat. 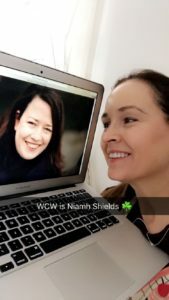 Niamh Shields of the famous food blog Eat Like A Girl has the most incredible snaps of her cooking, her adventures to various restaurants here in London, and her travels around the globe. So sit back, relax and let me shower Niamh with some LOVE! I had the pleasure of featuring one of Niamh’s soup recipes here on the blog last year in my Soup Scentral round up. And the best surprise was when I got to meet her in person. 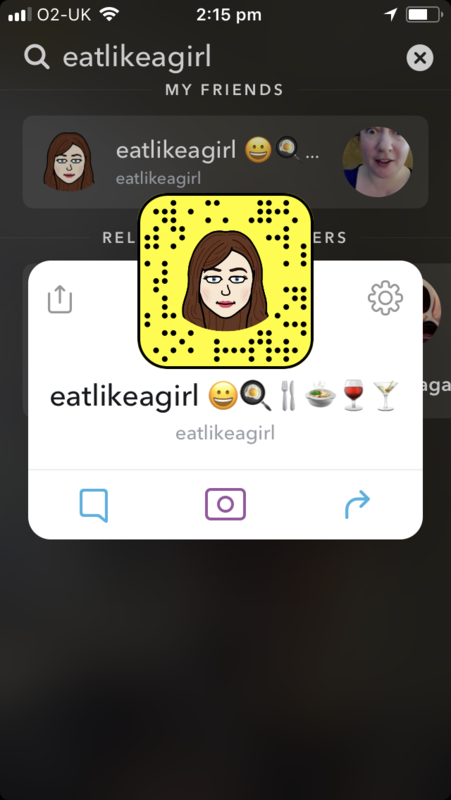 In July I attended a Just Eat evening food fest as a guest of Miriam O’Sullivan, one of my Sunday Spotlight Snap Sistas. As we were diving into our meal, I looked up and saw Niamh who was also attending the event. She and her friend ended up sitting with us and it was as if we had known eachother for ages. 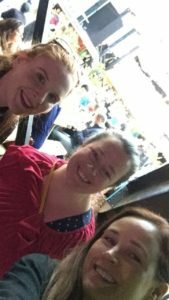 I might just say for the record the Irish flag was waving fervently as Niamh, Miriam and yours truly are all Irish citizens living in London. 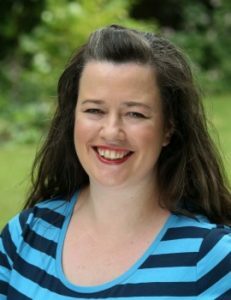 Niamh is a scientist turned food writer. And her book Comfort and Spice is on my Christmas wish list. 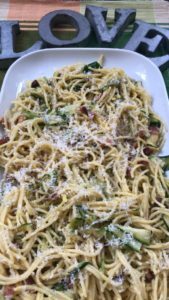 So until I get that, I decided that I would share a recipe from her prolific blog. Yes she started blogging back in 2007! 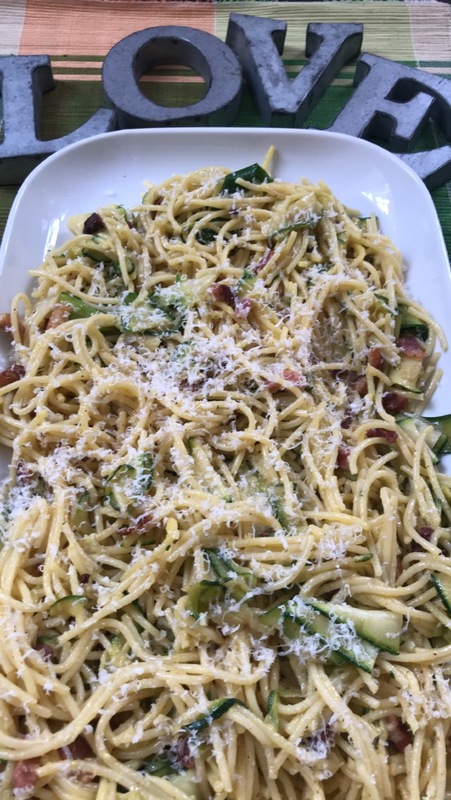 Since she is a massive fan of Italian food, and today is International Pasta Day, I thought I’d try her Courgette Carbonara. 25g (1/4 cup) pecorino sardo, finely grated (or parmesan cheese if you can’t get it) plus a little extra to serve. Cook the tagliatelle according to packet instructions in salted water. Once that’s started, fry the pancetta on a high heat in a frying pan until crispy. Add the courgettes and cook for 2-3 minutes until soft. The tagliatelle should be ready by now, when it is add the drained pasta to the pan. Let it cool for a couple of minutes and add the egg yolks and cheese and toss to mix. The egg yolks will cook slightly on the hot pasta but will retain a creamy texture. 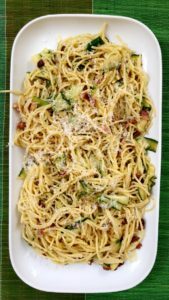 Be sure to allow the pasta to cool down just a little, otherwise, the egg yolks will scramble. 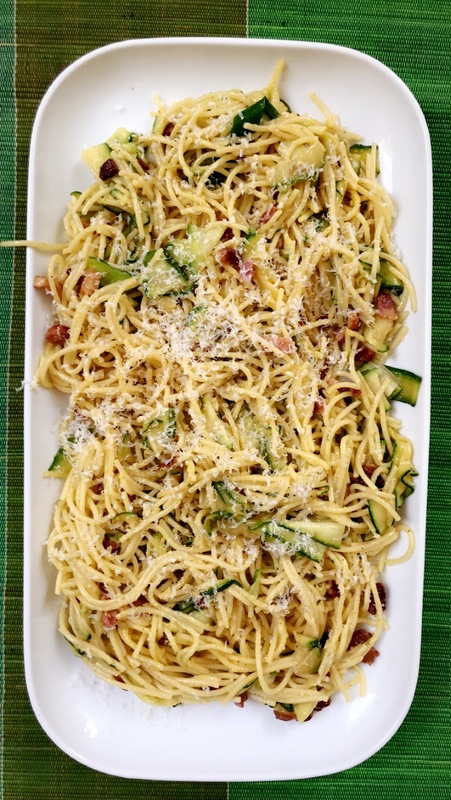 Season with S&P & serve with some grated pecorino sardo. I adore this recipe. Ease and simplicity, yet the perfect combination of elements is divine. 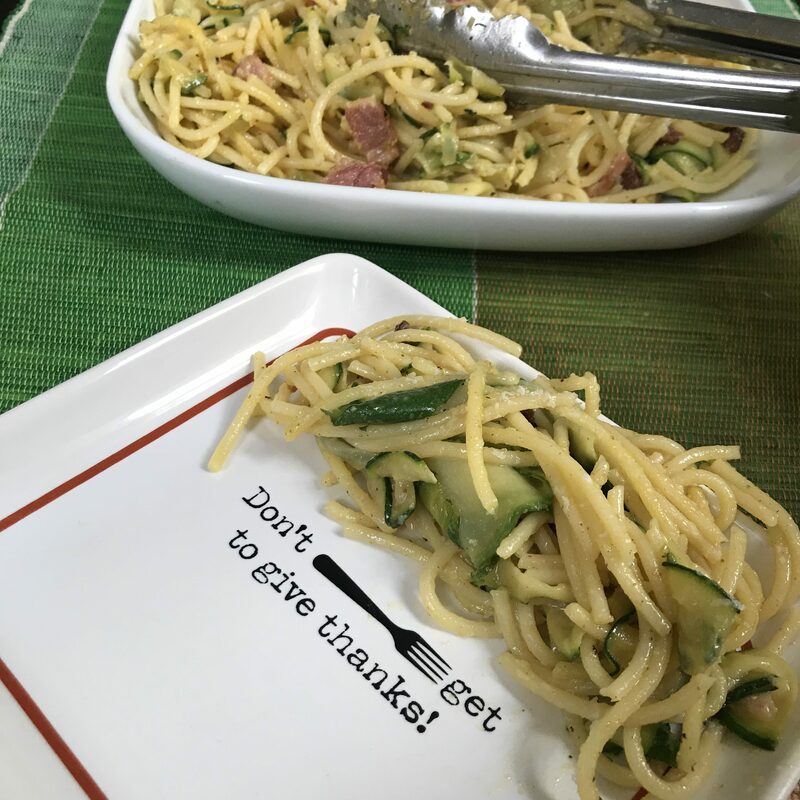 I know my hubby will LOVE this dish too. Satisfying on its own or as a side dish to a grilled piece of fish or chicken. It is always nice to have a meal that incorporates veggies because my hubby isn’t one to enjoy them on their own. 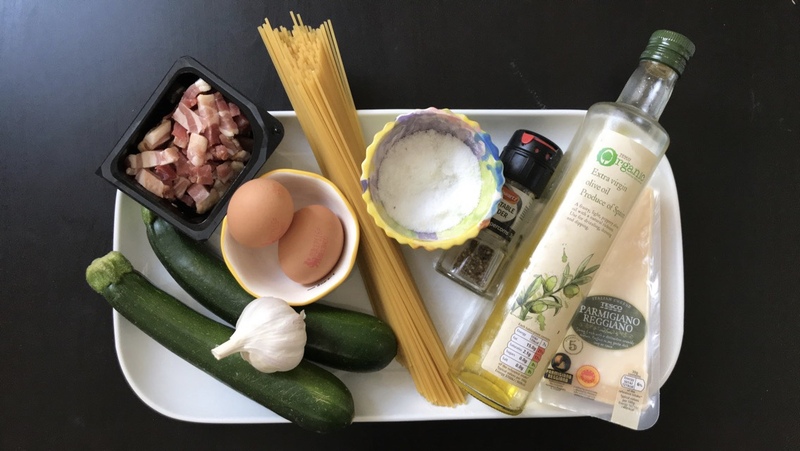 Spaghetti Carbonara is one of his favs, but this one will now replace it as our new go to! It is no accident that Niamh is a great cook. Being that she was a scientist she would have an empirical sense of order and structure, integral in cooking. She is very meticulous with researching details. And she emphasizes the added importance of ingredients, smells, spices, flavors and textures, which all ring true in the scientific world too. But what Niamh has that sets her apart is this beautiful sense of wonder and joy about cooking. While respectful to tradition she’s also not afraid to take risks. And she doesn’t take herself too seriously. She loves to laugh and has the best smile you’d ever see! Thanks Niamh for sharing your love of food, travel and life in such an effervescent and effortless way. You’re a massive inspiration for other foodie bloggers. You’ve done Ireland proud and I know I am not the only one who feels your Celtic warmth emanating off the mobile screen like a warm Irish turf fire. Looking forward to many more culinary creations of yours in the future! We’ll all be keen to keep tabs your epic social media feed ( Instagram, Twitter, Facebook) or Snapchat Stories and I hope to bump into you again here in London!